The National Democratic Alliance government is getting ready to scale down the size and speed of its signature Smart City Mission, if the need arises. Not keen to delay the project, the Centre may fund only 10 cities, instead of the proposed 20, in the first year, if proposals don’t match quality yardsticks. 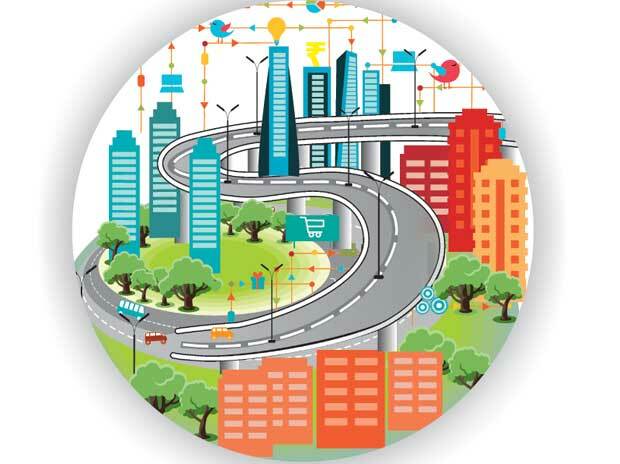 The idea is to not slip on the target date (January 26) for announcing the first list of smart cities, a segment that could mean a long-term opportunity of $50 billion in India. December 15 is the cut-off date to be eligible for the Centre’s funds. If states submit “inadequate or incomplete” area development plans to the urban development ministry by then, the number of cities to be picked up for the first round would be lower, a source in the government told Business Standard. “The government is sure of at least 10 quality proposals, though it would like to start with 20,” the source said. Most BJP-ruled states are ready with their city development plans, according to an official in the urban development ministry. The states that are expected to submit “quality” proposals by the due date include Maharashtra, Haryana, Gujarat, Rajasthan, Madhya Pradesh, Odisha, Tamil Nadu, Karnataka and Andhra Pradesh. The Delhi government could also submit its plan because it’s meant only for the New Delhi Municipal Council (NDMC) area, a small part of the city. Telangana and Chhattisgarh are among the others that are seen as “serious” with their planning, and could end up submitting good proposals, officials said. The cities which could make it to the first list include Pune, Thane, Navi Mumbai, Vizag, Jaipur, Udaipur, Surat, Bhopal and NDMC area of Delhi, people tracking the process said. 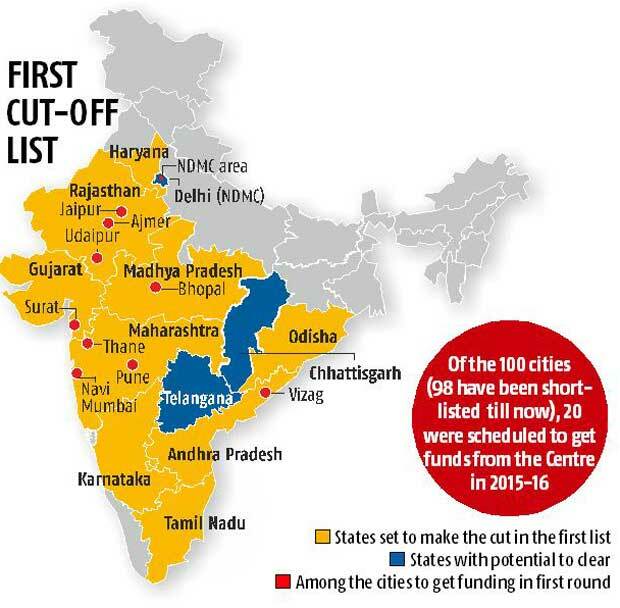 Of the 100 cities (98 have been shortlisted till now), 20 were scheduled to get funding in 2015-16. The Centre would spend Rs 500 crore on each city, in phases, while the remaining amount is to come from states, urban bodies and private partners. A few months ago the Cabinet had cleared Rs 50,000 crore for the project and another Rs 48,000 crore for AMRUT (another city rejuvenation plan) — both schemes were part of the election plank of NDA last year. Many of the states are going slow on their smart city plans because of the push and pull between greenfield, or new projects, and brownfield, or retrofitting projects, sectoral experts pointed out. The recent Chennai floods may also have delayed the plans of some states. Estimates suggest that building a new smart city with one-million population would cost Rs 20,000 crore a year for the next 10-15 years. Building on existing cities would be cheaper, depending on the nature of retrofitting work required. But once a brownfiled plan is selected, it is hard to go back to a greenfield one, experts say. The minimum area under a greenfield project is 250 acres and that for brownfield is 500. Any redevelopment has to be done on an area of more than 50 acres. Though the guidelines permit both plans in “contiguous” areas, the interpretation lacks clarity, some state government representatives have said. “Opportunities will lie in the cities that don’t make it to the first list as everything will go back to the drawing board for them,” said Pratap Padode, founder and director at Smart Cities Council India. That will be the real churn of urban planning, as these states correct the situation after the first cut-off is over, he pointed out. The 98 probable cities were picked up through a ‘City Challenge’. But, the names will change as the competition moves from one round to another. More than 15 countries have collaborated with Indian cities in some manner so far.